There’s many reasons why braces are a popular orthodontic treatment among patients. Not only are they highly effective at correcting tooth misalignment and bite, but they’re also a tried-and-tested procedure for helping you achieve the straighter, more confident, and stunning smile you deserve. 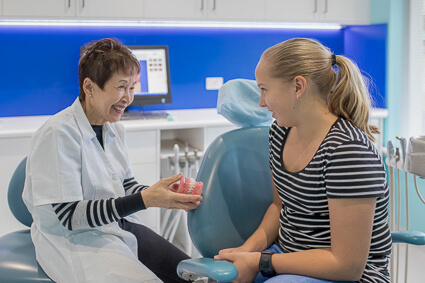 Because Harmony Orthodontics specialises in, and focuses purely on orthodontics, you can be assured that our professional team offer unrivalled experience and expertise within this field. We’ve fitted hundreds, if not thousands of patients with braces, and have produced successful and stunning results every time. Are You a Candidate for Braces? During your initial consultation, our orthodontist will thoroughly assess your mouth, teeth, and jaws to determine if braces are the right treatment for you. Traditional metal braces: These braces use fixed metal brackets and wires to realign teeth. While they were once associated with big, bulky appliances that were anything but flattering, today’s metal braces have come a long way. Not only are they much smaller, but they’re also created to perfectly fit a patient’s mouth. Invisible braces (lingual braces): These braces are very similar to traditional metal braces, however they contain one major difference. Invisible braces are fixed to the back of the teeth, resulting in braces which are completely hidden when you smile. Not only are they discreet, but they’re highly effective too. Ceramic braces: These braces are also quite similar to traditional metal braces in size, shape, and the way in which they work, yet their brackets are made from a tooth-coloured, or clear ceramic material to blend in more seamlessly with a patient’s smile. In some cases, tooth-coloured wires are also used, resulting in an even less noticeable appearance. Do you wish to discuss any of these braces listed above with our professional team? Please call 08 9354 1080 today to schedule an initial consultation with Dr Manaf!